What do you get when you shed some weight, pack some muscles and get new spiffy threads to fit that toned body? 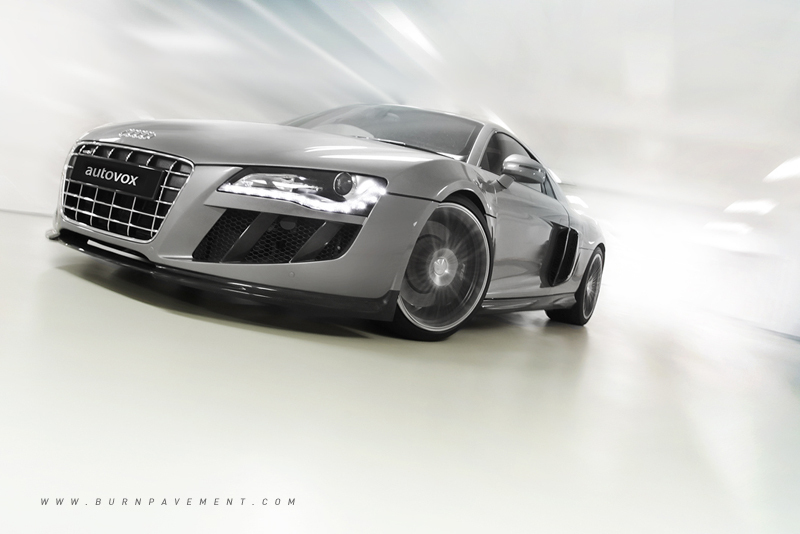 Why the ABT R8 of course! A good power-to-weight ratio isn't everything. Imagine driving a 600 bhp Bentley that weighs 2,000 kg, versus a 300 bhp lightened DC2R with 1,000 kg. Get the picture? Both have the same power-to-weight ratio, but we're pretty sure the Integra will be more agile and quite possible, faster! 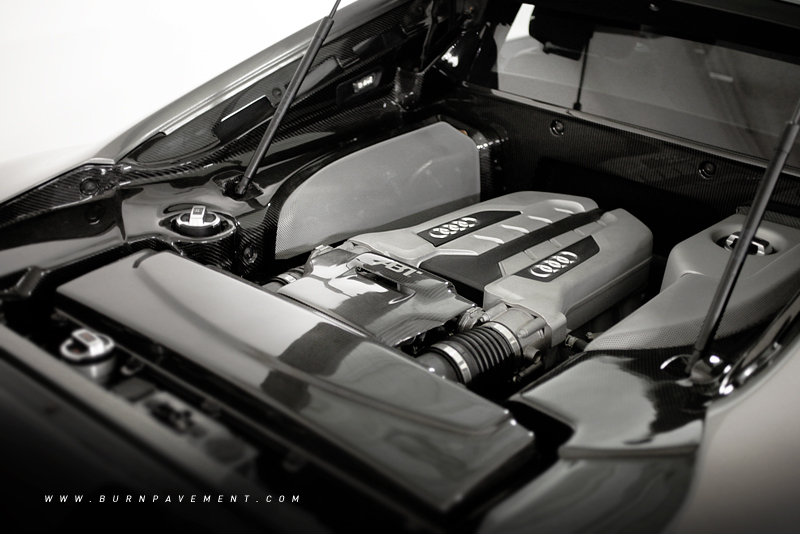 To feel and drive more nimbly, the donor R8 had to go under a weight loss program. This is the first time we're doing a reverse documentation of a project car - we'll post photos of the 'before' shots down the road, but we trust it'll be interesting for all of you. 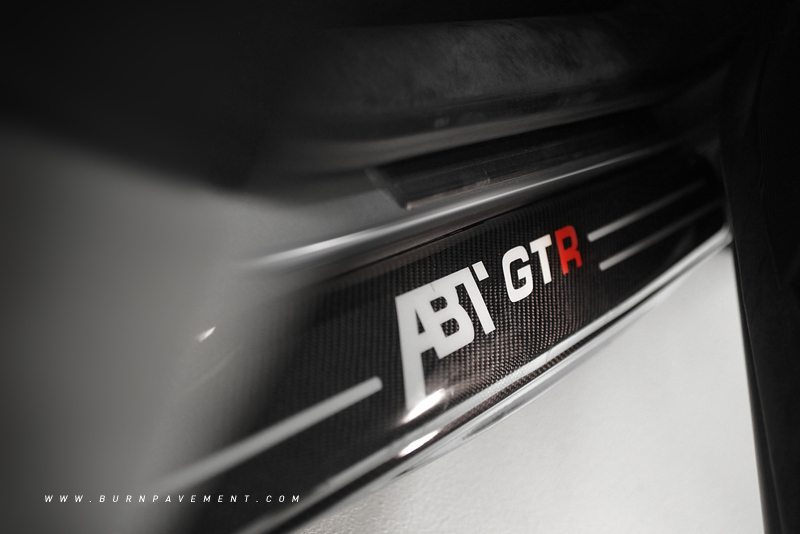 So we'll start from the finished product - This is the story of the ABT R8 Project car. First things first, a new colour had to be picked. Using Sikkens water-based paint, AutoVox's in-house paint specialists got to work to blend a unique gun-metal hue specially for the car. The car was stripped down and bumpers were replaced with light-weight ABT aerodynamic parts made from carbon fibre. 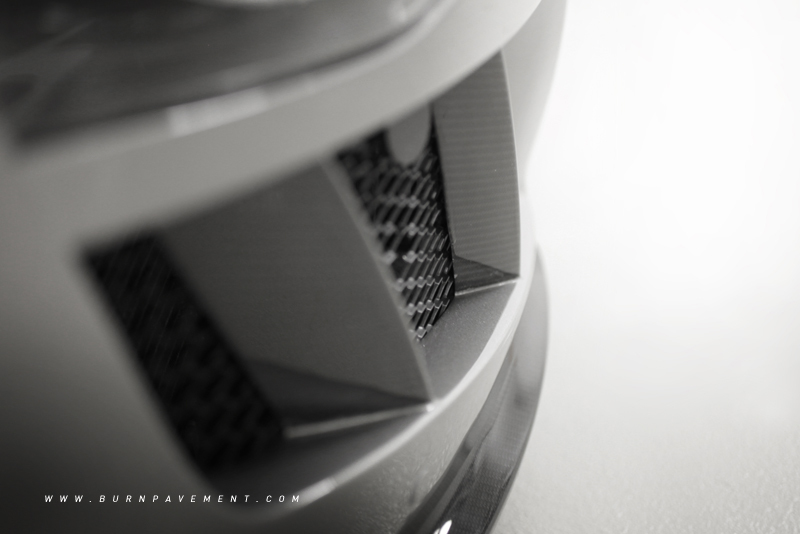 The rear bumper features diagonal outlets for the stacked Capristo exhaust tips. 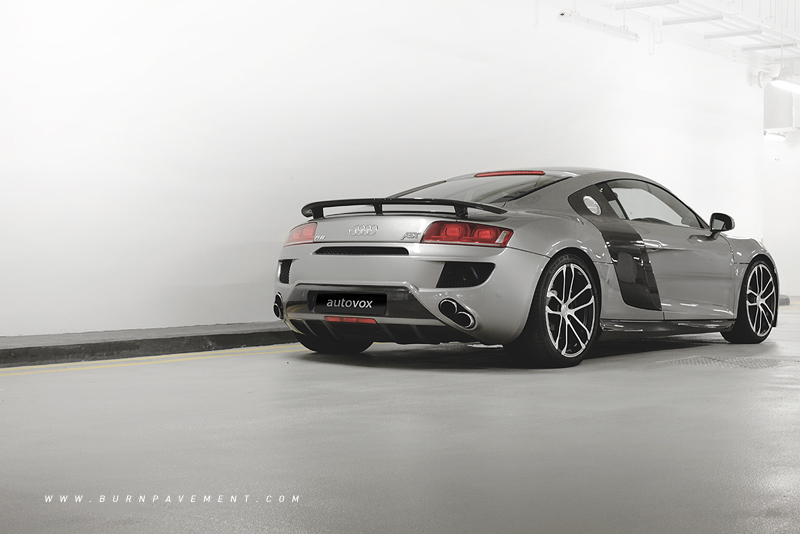 Capristo exhausts have a truly orgasmic howl, the one on this R8 is no different. The best part is, you can control the noise via a remote control fob. Press for once for 'HELL', press once more for 'HEAVEN' - which noise is for which description is entirely up to you. 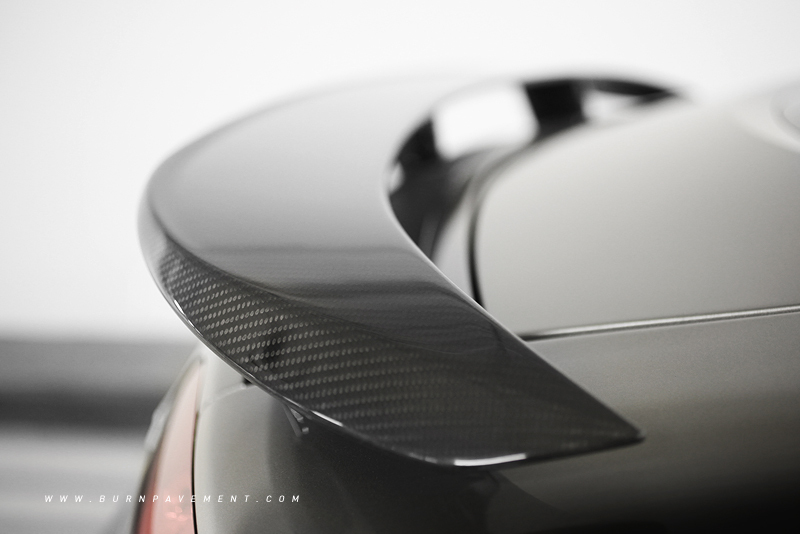 Carbon fibre rear wing adds more aggression and kills the clean lines of the stock car's profile. Nice, but we do wish it was wider - looks a tad small now. 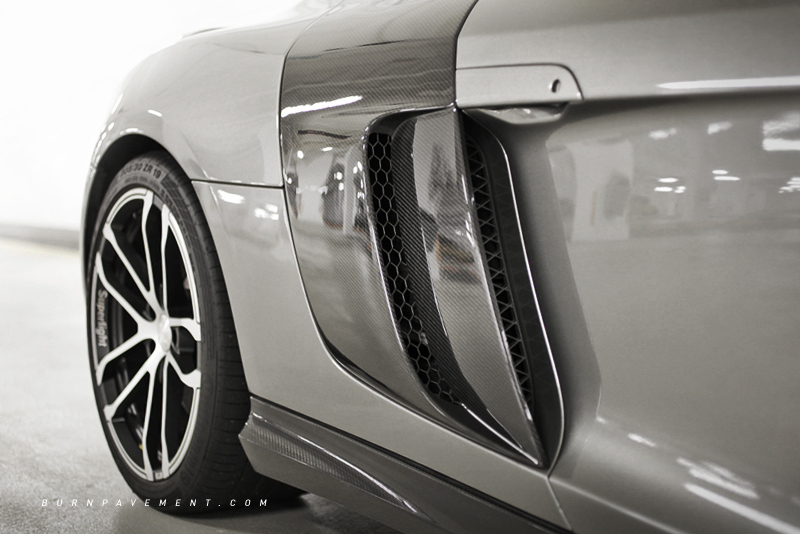 The front bumper was selectively painted to reveal the natural grain of the carbon fibre at appointed areas. To make sure the bumper is protected from high speed bumps, a set of KW coilovers with Hydraulic Lift System has been installed. Sweet! The interior has been fully redone as well. Alcantara with nappa leather were the main choice of materials for the soft areas. A combination of red and black shades was chosen to really bring out the interior. One thing to note is that Alcantara is also lighter than standard leather, which contributes to the shedding of weight. Carbon fibre inserts on the steering wheel, gear shift knob, handbrake handle, entrance sills, interior panels, all help to make the exterior and interior more cohesive. It's a lovely place to be in, comfortable yet sporty without being too loud. The fit and finish is also perfect, considering the whole interior was stripped out and put back together again. 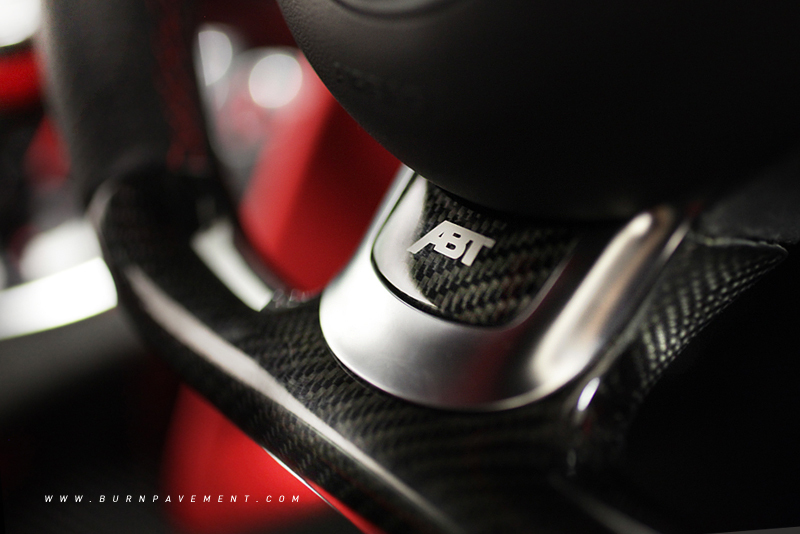 A name synonymous with quality enhancement parts, ABT is a German tuning house with a strong presence here in Singapore. As sole importer for the brand, AutoVox recently partnered with ABT Sportline GmbH to open a Singapore showroom along Commonwealth. Moving along the rear of the car, you'll notice a double bladed side intake instead of the usual single vent. This ensures optimum cooling for the V8 that sits behind. Also in carbon fibre are the new side skirts. 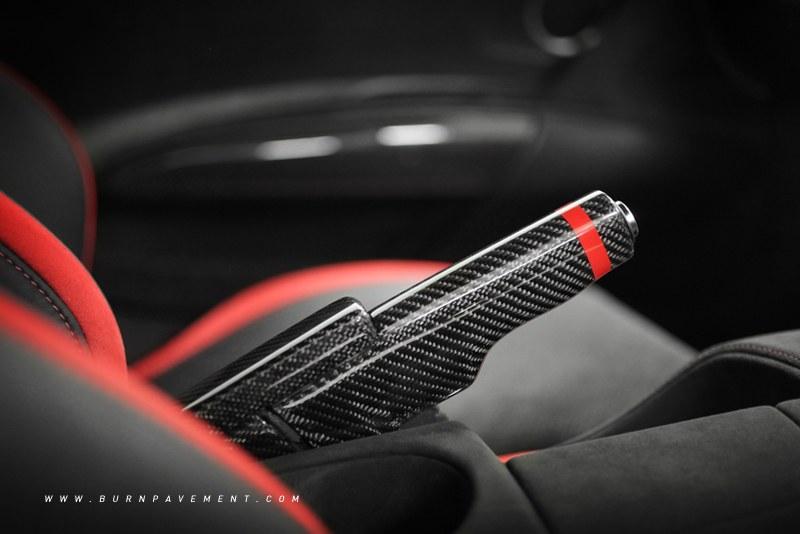 Pop the rear hatch and you'll see more carbon fibre (almost every photo and caption in this article has the CF word) - which tells you how serious this car is about weight loss. A slight boost in power comes feeding the 4.2 V8 with a set of Pipercross sports air filter system. Where there's an 'in', there's an 'out' - handmade Capristo stainless steel high-airflow exhaust system with valve control takes care of the exiting air, helping the car to breathe better, while making it sound downright awesome. 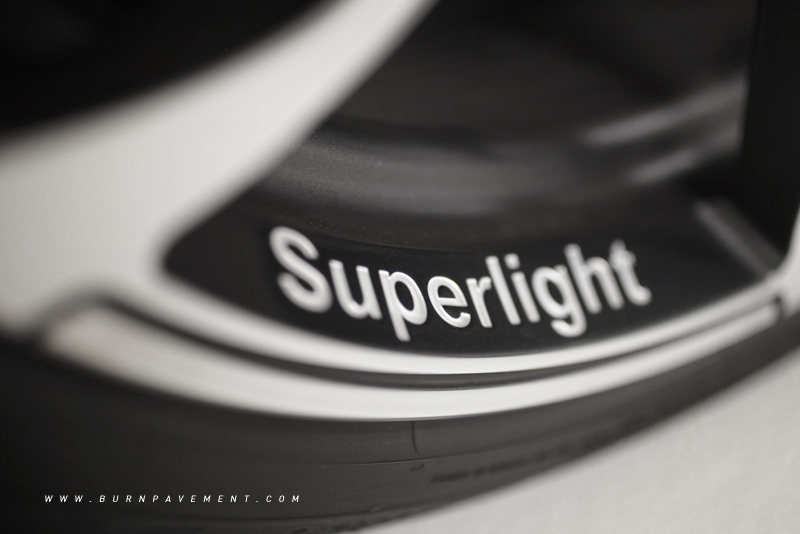 Unsprung weight is also key in a car's performance, so ABT superlight forged CR wheels lend a hand in this area. Measuring 9 X 19 in front and 11 X 19 at the rear, with the award-winning Continental CSC 5 tyres wrapping the wheels at a profile of 235/35/19 in front and 305/30/19 at the rear. Enough about the specs. So what's it like to drive? 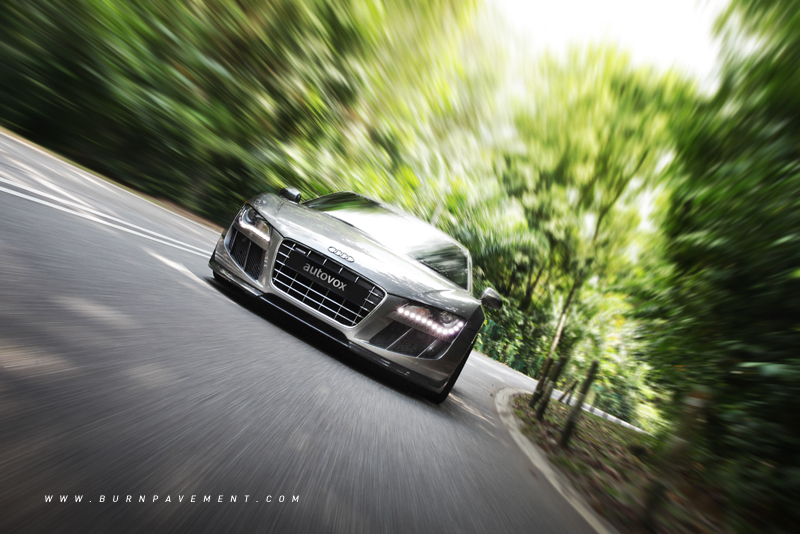 The car definitely feels more nimble than a standard R8. 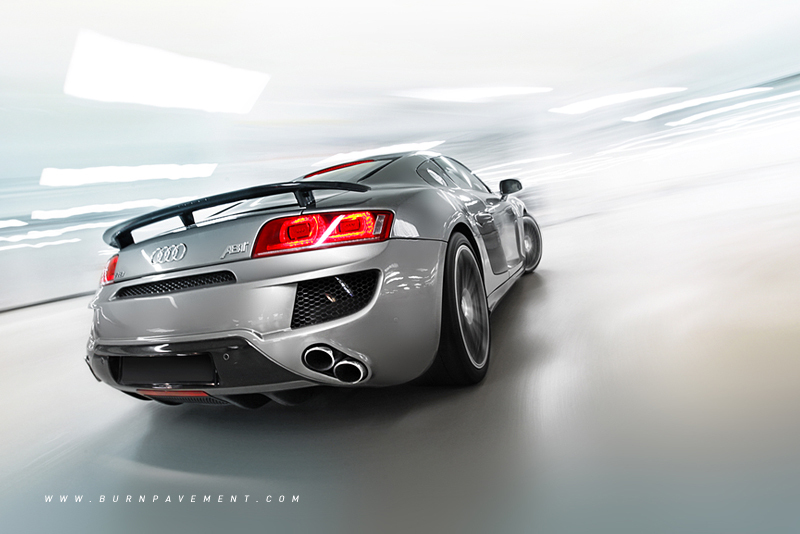 Lithe and agile, the ABT R8 turns in with more liveliness and darts around with more fervor. The R-tronic gearbox is still a chore at low speeds, but at full chat, the car is staggering. AutoVox's Xcelerate e-throttle enhancer sharpens the throttle response, and the car pounces like a tiger would on its prey every time you floor the pedal. Did we mention tiger? I think we meant a spine-tingling freakin' banshee! Because that's what the car sounds like at full chat! Gunning down Upp Thomson Road, birds would flee from their peaceful nests, while monkeys scampered away into the trees as this screaming supercar wailed past them. Loud, is an understatement. Once we got on the highway though, a press of the remote valve reverted all things back to normal, lest we captured the wrong attention. One special mention has to go to the ride quality of this car. As always, KWs impress me once again. Supple, relaxed and well damped, the suspension is both sharp and comfortable - an almost impossible combination in most cases. All in all, a very extensive and detailed modification process that deserves a two-thumbs up! 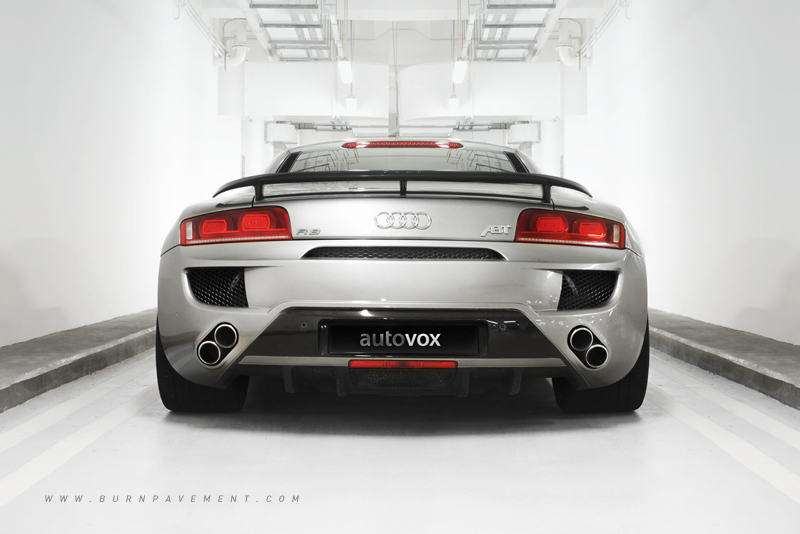 The ABT R8 will go on sale soon - I will go as far as to guarantee that this is one car you can part your money to get. It's a gem!